Oliboard ePen is the ideal interactive whiteboard for use during business meetings and learning activities due to its practical design and accuracy which allow a natural writing style. 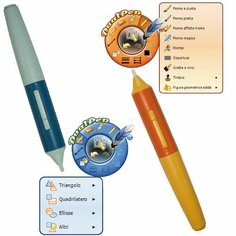 The electronic pens can be used for writing also with hands resting on the whiteboard, or touching it with your fingers, without any functions being activated unintentionally. Ergonomic and easy to use, the pens soon become second nature: the pressure-sensitive tip can be used to emulate intuitively the mouse left-click – differentiated from the simple mouse-over (or "hover") function - while the pen button provides the mouse right-click. The two pens, individually recognised by the whiteboard, together with the ensuite Oliboard software, allow two people to operate in full autonomy.